Despite its small size, anthropologist Dean Falk says that the endocast of LB1’s brain indicates complex features similar to humans which may indicate mental capabilities like tool making. A replica of the contentious ‘hobbit’ fossils will be unveiled in April at the human evolution symposium at Stony Brook University. Everything you wanted to know about the Hobbit under one roof. Stony Brook University is holding a one-day public symposium, convened by palaeoanthropologist Richard Leakey and hosted by the Turkana Basin Institute. The symposium will feature a who’s-who list of researchers presenting the latest on the Hobbit research and the debate. 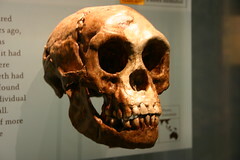 You know it’s a sign of hobbit-fatigue when a new claim about the hobbit pops up, and all you can say is, “…uh-huh.” This new claim swings the pendulum back to the “new species” camp, after a new study compared the cranial morphology of the hobbit with a simulated 3D model of a hominid with the same size. The correlations in the 3D model seem to indicate that the hobbit fits the parameters of a small hominid rather than a human, deformed or otherwise. Of course, this is not the last we are going to hear about the issue. I doubt detractors are going to accept the hobbit-as-a-separate thesis on the basis that the hobbit’s cranium fits the prediction by a computer model. Incidentally, the Journal of Human Evolution has a whole series of papers published around the same time about the Flores skeletons and archaeological material, including descriptions of the Hobbit skeletons. Professor Colin Groves will be giving a talk on the Flores Hominid, aka fomo floresiensis, aka the hobbit later this month in September. Do give a visit, if you’re in the vicinity of the Australian National University.